1400. 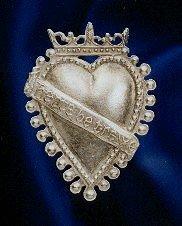 A crowned heart with a diagonal band having the inscription "Herte be trewe". Surrounded by pearls to represent purity. height 5cm.